In leading organizations, managing diversity is no longer limited to increasing representation of a certain identity group and building equality. Rather, both the definition and the focus have expanded to include not only the workplace, but also the workforce, the marketplace, the community, and suppliers. An increasing number of organizations are adopting diversity and inclusion strategies; not only for ethical and legal reasons but also because it positions them to be more competitive. Among the most important of these benefits are attracting and retaining the best talent, improved corporate image and reputation, increased employee engagement and productivity, greater innovation and enhanced marketing opportunities. 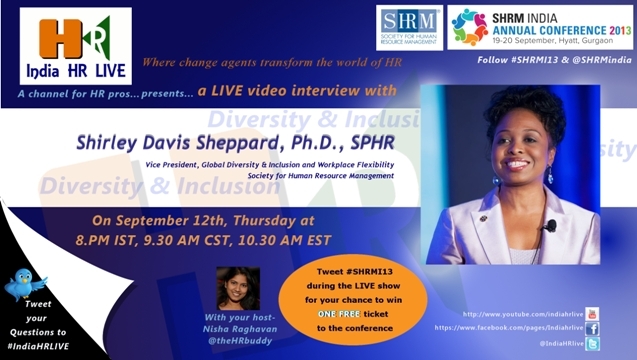 In this discussion, Dr. Davis will provide key insights into why diversity is good for business, highlight some examples of leading organizations that have realized the benefits of their diversity initiatives, and leave you with several trends, strategies, and tips that you can implement and contribute to your organization’s business success. Dr. Shirley Davis is an accomplished corporate executive, global workforce and talent management expert, author, and a certified human capital professional. She travels around the world speaking and consulting with business leaders, senior executives, staff employees, government and military professionals, and academicians providing strategies and solutions for how to work and lead in a much more global, virtual, diverse, and hyper-connected workforce. Her presentations are engaging, informative, and solutions-oriented. She has keynoted/presented in more than 10 countries. Dr. Davis also possesses an accomplished history as an executive with Fortune 500 and 50 companies and currently at SHRM, the world’s largest HR membership association. In these companies she has led such functions as Learning and Development, Recruiting, Organizational Change Management, Performance Management, Global Diversity and Inclusion, Operations Training, Sales and Customer Service, and Management Development. Dr. Davis’ educational background demonstrates her ability to succeed. Her educational accomplishments include: a Bachelor of Arts in Pre-Law with a minor in Communications from the University of Maryland, College Park (1988); completed a certificate in Organizational Change from the Darden School of Business Executive Education Program (1999); Harvard School of Business Management Development courses (1999-2000); a Master of Science Degree in Human Resources Administration from Central Michigan University (2000); and a Ph.D. in Business & Organization Management from Capella University (2007). She is also certified as a Senior Professional in Human Resources by the HR Certification Institute. In 2008, she was named Chief Diversity Officer of the Year by Profiles in Diversity Journal and as one of the Top 100 Corporate Executives in America by Uptown Professional Magazine for the past three years. In 2011, she was named as a 2012 “Woman Worth Watching” by Profiles in Diversity Journal and she received the “Strategic Star” Award by Diversity Woman Magazine in 2012. Outside of the office, she’s also been a trailblazer winning the titles of Mrs. Oklahoma in the Mrs. America Pageant, Mrs. Virginia in the Ms. America United States Pageant, and ultimately capturing the national title of Ms. America United States Woman in 2000. Additionally, she held more than 12 other state and local pageant titles. She is a featured speaker with Mr. Les Brown, world renowned motivational speaker, author, and talk show host and went on to host her own talk show in 2009-2010 called, The Success Doctor. Do you have any questions for our special guest? Hit the hashtag #IndiaHRLIVE on twitter during the LIVE show!! You can watch the LIVE show at our website http://IndiaHRLIVE.com or at our Youtube channel http://www.youtube.com/user/IndiaHRLIVE/live during the scheduled time. after review your post, I will spend my time on every social sites.